It’s essential for Europe, including Russia, to establish a collective sense of self-identity in order to counter what has alternately been described as Atlanticism, the global consumerist monoculture, and ‘McWorld’. This year the United States began to convert the relatively loosely connected Eastern European countries into a serious anti-Russian bloc. This occurred in response to the actions of Russia in the Crimea and the uprising in the Donbas. In addition, Russia has stepped up its cooperation (including military and technical cooperation) with China, India, Iran, and Latin America. The Americans, in response, have focused on their traditional Anaconda strategy. All American activity in the region should be interpreted through the prism of Mackinder’s Heartland Theory, because it has remained an essential mainstay of geopolitics since 1900. Since the creed we find in Mackinder’s doctrine was formulated, nothing has changed. There are two key points in what he calls the Eurasian Rimland - the Middle East and the cordon sanitaire in Eastern Europe. In the Middle East, Atlanticists employ a strategy of controlled chaos, while in Eastern Europe we see a combination of this model (Ukraine) and an attempt to create an anti-Russian fist of American Eastern European satellites. NATO has demonstrated its presence in Eastern Europe and strengthened its military component. There are plans to place additional troops in Eastern Europe. In particular this applies to Poland, Romania and the Baltic countries. Since April of last year, a set of military exercises have been performed within the framework of the implementation of Operation Atlantic Resolve. The exercises won’t finish for a year; they are taking place in Eastern Europe, primarily in the Baltic States, as well as in Romania and Poland and also the partially-affected Czech Republic. Maneuvers are also taking place in the Baltic and Black Seas. The objectives of these activities are: as a show of force, to demonstrate NATO’s presence in the region, the strengthening of military-technical cooperation between the alliance countries, and to improve the quality of interaction between the respective armed services of the Americans and their Western and Eastern European allies. The key countries here are the Baltic States, Poland and Romania. It should be mentioned that in addition to military exercises in these countries, there was an increase in the amount of anti-Russian hysteria in the region, even including arrests and searches of those who dared to have independent position on their countries’ foreign policies. The most remarkable were cases of Lithuanian nationalists who were blamed for publishing Alexandr Dugin’s texts on their web-site. The unusual and untimely death of Vlad Hogea, the young leader of the “United Romania” party in December 2014 can be compared with the similarly strange death of Andrzej Lepper in August 2011 (the leader of the right-wing populist party “Self-Defense” in Poland). These illustrate how being part of the opposition in Eastern Europe can cost you your life. Why is so much attention being paid to the Baltic States, Poland and Romania? Firstly, there is a purely geographical reason: the Baltic States, Poland, Ukraine and Romania lock in Russia, separating it from central Europe and especially Germany. With the participation of these countries, a cordon sanitaire stretching from the Baltic to the Black Sea can be built perfectly. To accomplish this, these countries are enough. Secondly, two of these countries, Poland and Romania, are the largest in the Eastern EU in area and population and have the most military potential in the region. The Polish population is 38,346,279 and its active personnel number 130,000. For Romania these figures are 21,730,000 and 73,000. For comparison, the Hungarian army numbers only 29 000 and Serbia has only 20,000. Both countries (Romania and Poland) have their own military industry, and Poland has over half a million reserve troops. In both countries, society’s elites and the common people alike traditionally perceive their countries as outposts of Europe and the Western world as a whole and see themselves as defenders from eastern enemies. Both countries have developed geopolitical concepts that justify eastward expansionism. In Poland, this is a version of the old Yagellonian idea, named after the dynasty that ruled during the Rzes Pospolita. The main ideas were formulated a century ago. There are the concepts of Intermarium and Prometheism, as well as ULB (Ukraine-Lithuania-Belarus or Giedraitis-Meroshevsky). While the other versions of the Yagellonian line of thought lay bare a clearly revanchist agenda, the Intermarium, Prometheism and ULB doctrines pretend to be purely liberal. They suppose a key Polish role in bringing “democracy” to Ukraine and Belarus and also propose to plan the destruction and fragmentation of the geopolitical space of Russia. It is significant that this year the concept of Intermarum was again actively discussed among the public, not only in Poland but also in Ukraine and Belarus. In Romania they have their own eastern pretentions: the country maintains claims to Moldova and Transnistria and many support the anti-Russian concept of the "geopolitics of Orthodoxy" which was elaborated by the Romanian geopolitical analyst Simeon Mehedints and based in the denial of Russia's role as a leader of the Orthodox world. So for Romanian geopolitical tradition, it is crucial to insist on independent policy from Russia and the use of conservative orthodox rhetoric against Russia. The third reason: neither of these countries were close friends of Russia or Germany, historically. This perception is based on the history of wars and submission and today’s leading role of Germany in the EU. German and Austrian businesses have bought virtually all the lands, resources and industry in Romania and Poland. So the rejection of western hegemony and TNC in these countries is often reduced to banal germanophobia. That factor is often used by Soros and his partners, who massively penetrate all protest movements against the destruction and theft of country’s natural resources. That hijacks the reorientation of these countries and the possibility of them entering into any continentalist projects. In addition to these objective reasons, there is also a subjective one: the desire of both countries to take advantage of the privileged role of the US partners in order to raise their respective profiles in the region. In addition to that, as for Romania, there is yet another reason: it wants to use America’s external support to strengthen its position in Transylvania. At a time when Hungary is not subject to the dictates of the US, the Romanians expect to put a halt to the Hungarian claim to the region by transforming itself into a key US ally in South-Eastern Europe. The role of other Eastern European countries is less significant. However, Atlanticists take them into account. Keep in mind that in Hungary, the United States has tried in different ways to influence the policy of Viktor Orban, even resorting to the use of color revolutions. The United States also initiated a political crisis in Macedonia in January 2015, after Prime Minister Nikola Gruevski agreed to join the Turkish stream project. The Macedonian crisis we are witnessing now shows that the Atlanticists are able to make use of different extremist organizations in the Balkans and play the card of Islamic extremism. That is true in the case of Bosnia, which saw a similar terrorist attack two weeks ago too. Perhaps the most thoroughly Americanized Eastern European countries are the Baltic States, a fact which becomes obvious when you consider that all three of them have had presidents who were raised in North America. Latvia’s President Vaira Vīķe-Freiberga, who spent most of her life in Montreal, was instrumental in making Latvia a NATO and EU member state, and following her second term she was considered for the post of Secretary-General of the United Nations. Estonian President Toomas Ilves, who is currently pushing for the construction of housing for NATO troops on Russia’s western border, grew up in New Jersey, graduated from Columbia University, and started his political career as an anti-Russian propagandist for Radio Free Europe. Of course, there are the Eastern European countries that are trying to maintain a somewhat more independent policy, such as Hungary, Slovakia, Serbia, Macedonia, and Greece (which is not traditionally considered to be part of Eastern Europe, but in terms of geography is part of the region). However, their potential is limited. Most importantly, none of them are essential to the establishment of a cordon sanitaire. For this we need to focus on Poland, Romania and the Baltic States, with Poland and Romania being first and foremost. This is pure geography: Romania locks the gates to the Balkans, and Poland lies between Russia and Central Europe. What is the political situation in Eastern Europe, particularly in these two key countries? Actually the sphere of internal politics is dominated by Atlanticist structures. Continentalists are marginalized or divided and fragmented and the formation of new structures has stopped. That was done with the United Romania project for example. The exceptions are Hungary, Greece, and Macedonia. The “Dveri” movement in Serbia has some political potential. The popularity of the "ATAKA" party in Bulgaria is on the wane and other anti-Atlanticist structures are marginal. Estonia and Latvia can both boast that their pro-Russian parties (Centre Party and Harmony) are the biggest in these respective countries, but the pro-Atlanticist coalitions have relegated them to the opposition. An interesting example could be the creation of the "Change" party in Poland, however, they remain marginal and they have just started their political lives. What is more interesting is that the Atlanticists use conservative rhetoric in both Poland and Romania. This strategy was used for years in Poland and is today on the rise in Romania, where they created intellectual centers and political structures that merge conservative discourse with a clearly anti-continentalist geopolitical stance. The most spectacular example is the Romanian source inliniedreapta.net, which is conducted by the heirs of former communist internationalists of Jewish origin (who resemble the neocons in the US). That strategy can be clearly explained, because conservative values are normal for 99% of Romania’s population. The support of some parties that look leftist to Westerners is based on their clear support of conservative values (“Smer” in Slovakia, and the Social-Democratic Party in Romania for example). Usually the structures of the socially conservative, social populist ideological trend have the greatest support among movements and parties with a euro-continentalist position. Appeals to traditional values and the sovereignty of states are finding their place in the hearts of Eastern Europeans. 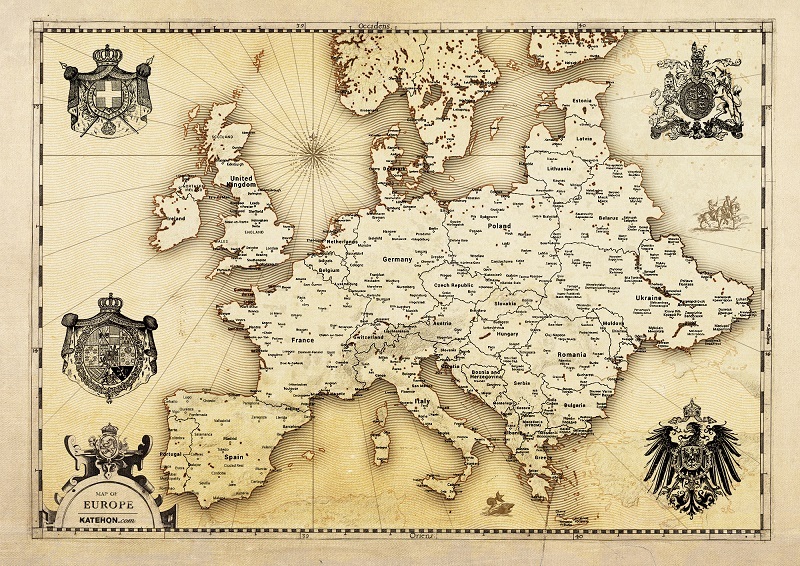 The Atlas of European Values, a jointly-produced assessment of Western and Eastern Europe which is published by scholars based in the Netherlands, shows that Eastern Europe is traditionally a stronghold of conservative values. The region is home to the greatest number of people with positive attitudes toward the church in Europe, as well as the largest number of people who categorize themselves as religious. Eastern Europeans are least positive about the gender values promoted by the EU. This potential can be tapped, but must be used intelligently, through the ideological models addressing the real problems that concern Eastern Europeans: loss of sovereignty, economic dependence and crisis, the sale of land and resources to foreigners, and the unstable future of the EU. In the process of implementing quotas on migrants, the problem of third world immigration could emerge, especially when this problem (an influx of migrants) is coupled with an outflow of native people from these countries. So the ideological and geopolitical models that address the real problems of eastern Europeans should be proposed by Eurasianists, not the nostalgic Stalinist-seeming left-wing agenda. In these models, historic memories that are specific to Eastern Europeans should be evoked. For example, their image of themselves as defenders of Europe and Christianity should be reoriented toward defense from liberalism, cultural Marxism, the ideology of political correctness, oligarchic capitalism, plutocracy, and the forces of global hegemony. It should be stressed that the US leadership is now taking part in an anti-European agenda. Unfortunately, attitudes towards Russia, the key country in the Eurasian project, are not positive everywhere. Whereas in most of the Balkan countries popular sentiment remains generally positive, the elite is anti-Russian or skeptical. In Poland and Romania, Russia is perceived with some anxiety, as many cling to memories of the countries’ troubled past. This is a problem that should be resolved. The continentalist leaders and structures in Eastern Europe should not look like the hand of Moscow. Moreover they should not be the puppets of Moscow or Berlin. Moscow and Berlin, the trans-geographical continentalist poles, should find political forces (supposedly in the national-populist camp) and think –tanks that share a continentalist worldview and can be partners rather than clients. They should be oriented primarily towards their own sovereignty rather than Russophilia in and of itself. So the Heartland, both European and Eurasian must work in this direction.